Thursday December 25th 1924 It was late when we got up. Jean went home last night. It was very cold but Ott got the car started and we went up to Hatties about noon. They had a fine dinner and so many presents. I found something there from Birdie and some mail. Hattie came home with us about five oclock and later the others came over. Fannie prepared supper and after that we had a grab bag. It was nearly eleven oclock when The folks went home. Fannie talked to Des Moines. 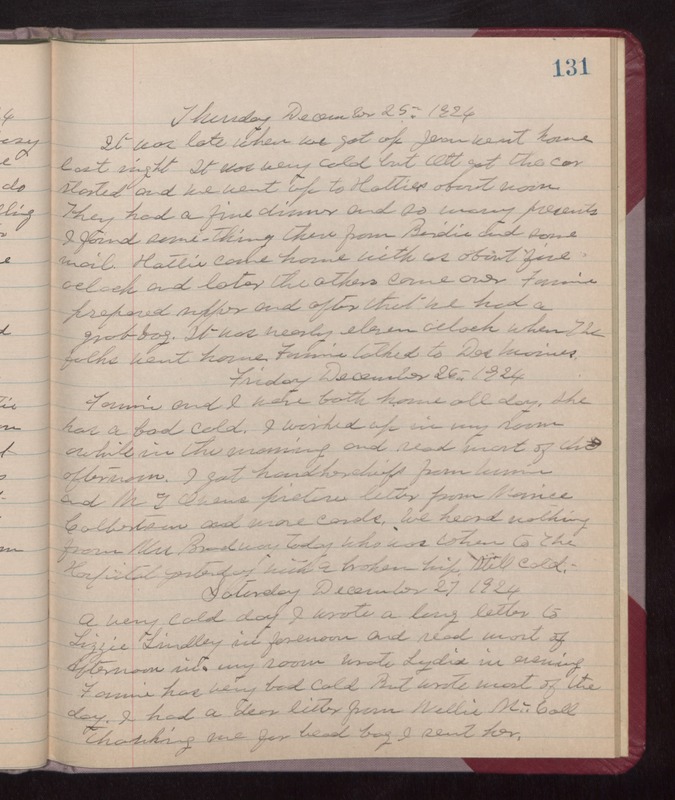 Friday December 26th 1924 Fannie and I were both home all day. She has a bad cold. I worked up in my room awhile in the morning and read most of the afternoon. I got handkerchiefs from Winnie and M T Owens picture. Letter from Maurice Culbertson and more cards. We heard nothing from Mrs Broadway today who was taken to the Hospital yesterday with a broken hip. Still cold. Saturday December 27th 1924 A very cold day. I wrote a long letter to Lizzie Lindley in forenoon and read most of afternoon in my room. Wrote Lydia in evening. Fannie has very bad cold But wrote most of the day. I had a dear letter from Nellie McCall thanking me for bead bag I sent her.